One for Lemonade lovers! Mix Juice Blackcurrant Lemonade blends the sharp, fruity tartness of fresh Blackcurrants with the zesty, refreshing taste of sparkling Lemonade. Akin to putting a drop of Ribena in favourite glass of cold lemonade. 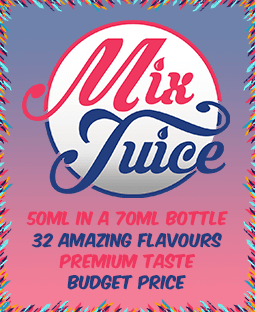 Mix Juice short fill eliquids are mixed with an 80/20 blend of VG to PG, perfect for carrying flavour and blowing thick, sweet smelling clouds.